If your surge protector or UPS is more than 3-5 years old, it may not be providing much protection. The bottom line is that these devices don’t last forever and should generally be replaced every 3-5 years or after a major power event. Surge protection is essentially circuitry that absorbs the hit of an electrical surge sacrificing itself to protect your connected equipment. Just like a helmet to protect your head, it can only take so many hits. And the bigger the hits, the fewer it will take. The catch is you can’t really tell what a surge protector has left. But if, for example, if a transformer blows outside your building and you know a major surge occurred, it would not be a bad idea to replace your surge protectors just like you should replace your helmet after it takes a major blow. You did know that didn’t you! The replacement cost of the battery is often nearly as much as a new UPS. The surge protection circuitry is probably nearing end-of-life anyhow. Never string Surge protectors and UPS’s together. 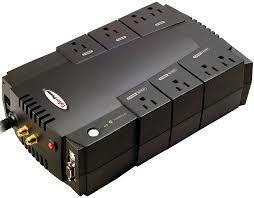 Some UPS’s have outlets that are just surge protected and others that are surge and battery backup. Pay attention to what you plug into which. Plug your computer and monitor in the backup outlets. Plug printers, calculators, etc. into the surge only side. And finally, not all surge protectors and UPS’s are created equal. Surge protectors have “reaction times.” The faster the better. A cheap or worn out surge may let a lot of energy past before it manages to clamp it off. And likewise, most UPS’s do some power conditioning. That is, nobody’s electric provides consistent voltage 24/7. A UPS helps mitigate that generally providing a more consistent power to your equipment. But some UPS’s are better than others. Exelos can review your network and help you make sure you’re making good choices to keep your network up and running. In the meantime, here is a good article that may answer a few more questions. 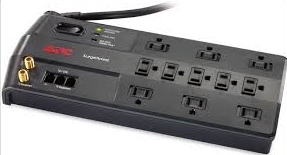 Comments Off on Do Surge Protectors and UPS’s Wear Out?